Does PAWS offer Burial/Cremation service for pets? Though PARC/PAWS shelter is not considered a "pet cemetery", we do make accommodations for pet owners who live in apartments or have no yard space to bury their pets in for as long as the pet did not die of a contagious disease (i.e. parvo, distemper). Burial fee for cats and average-sized (native) dogs is P500. It goes up to P1000 for large breeds. What PAWS offers is a mass grave, thus, we do not allow tombstones, lapidas or markings to be placed on top of the grave but you may want to consider getting a tile from our memorial wall (read more info below about the PARC Memorial Wall). However, PAWS recommends that people bury their pets in their own backyard or in their friends' / relatives' backyards because the PAWS mass burial site is nearing maximum capacity. Those bringing pets for burial must be prepared to wait as the caretakers are attending to the needs of live shelter animals and may have to finish their cleaning and feeding duties before being asked to dig for burials during office hours. Since PAWS does not offer burial/cremation, who can we contact for this service? PAWS does not offer cremation services. Below are list of columbarium/pet cemetery/vet clinics which offer cremation and burial services for departed pets. These facilities are just suggestions and are not in any way affiliated with PAWS. You may search online for more. Tel # 8814667 / 09286256949. Each memorial wall tile is P2,500 but the tile stays there for as long as the shelter is standing - a fitting tribute for dearly departed pets. Have you ever wondered if there's a place here in the Philippines where people can go to commemorate their pets who have passed away? Humans do it all the time in memorial parks and cemeteries where they occasionally visit the resting places of their relatives who have passed on. They light candles and offer flowers in honor and loving memory of their dead. PAWS, in a project called the PAWS Pet Memorial Wall, has made such a thing possible by allocating a portion of its animal shelter, a.k.a. 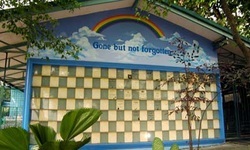 PAWS Animal Rehabilitation Center (PARC), for its Pet Memorial Wall where humans/pet guardians/owners can dedicate memorial wall tiles for their pets who have moved on to the rainbow bridge. While it is built for the memory of a departed pet, is not a columbarium to keep the cremated remains nor a place to bury the deceased animals. This project is also meant to raise funds for the shelter as each tile (dimensions: 8 x 10 in.) costs Php 2,500 (approx. $58) inclusive of a four-line dedication with layout provided by PAWS (for approval by tile owner). This is a pretty good way to create a lasting memorial to the pets that have been a significant part of our lives while at the same time reaching out a helping hand to the animals who are in dire need of our help at the shelter. The shelter currently houses more than 200 cats and 50 dogs, most of whom are looking for adoptive homes. The Memorial Wall will be maintained for as long as the shelter stands. For more information, please contact 475-1688 during office hours or philpaws@yahoo.com.